Time for a big update. The hunter is now nearly finished and only the hat is missing. Now he owns a gun another belt with a small pouch and a peg. I realy like this victoian beard. wow! i'm envious of your sculpting skills. 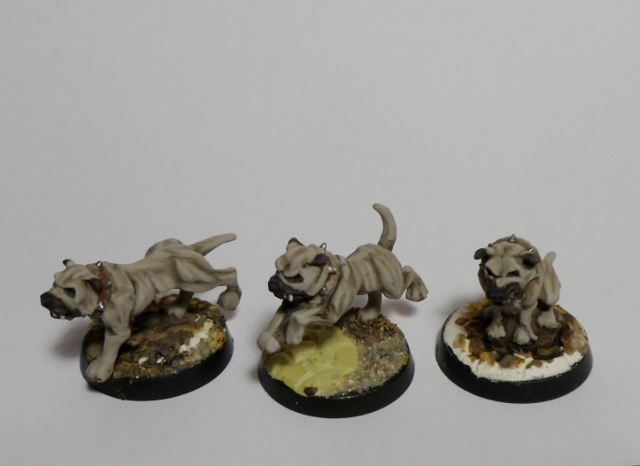 Love those marauder dogs, great paintjob! 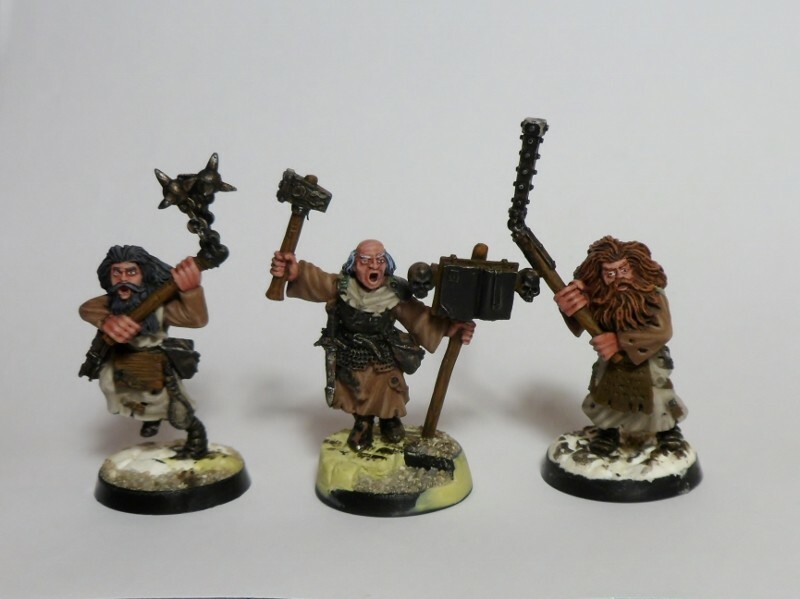 The dogs are finished and I began to paint the priest and the to flagellants. The skin and the hair is done and I applied the basecoat on the robes. EXCELLENT PROGRESS! The Dog painted up SPLENDIDLY, & Religious Folk are LOOKIN' GOOD...the faces, skin tones, & hair are particularly nicely done. GREAT WORK! This week I only finished the robes and I have to say, I hate them. Just like the dogs, I had to paint the robes two times. 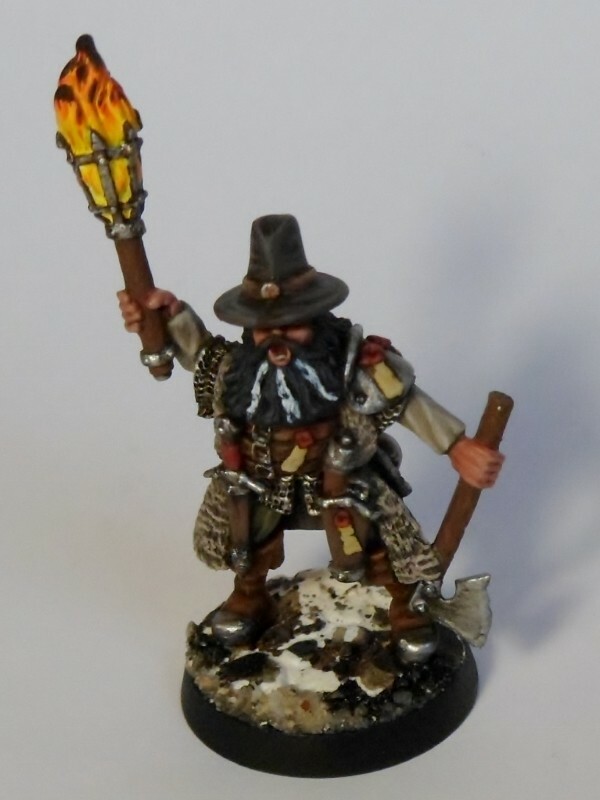 I mean the Slayer went out so fine and easy and the Witch Hunter Miniature are such a pain to paint. i really like the robes! the colours are natural looking, a bit shabby but realistic. Ultimately you are the only one who has the deciding vote, but the Priest & his loony Zealots look TERRIFIC to moi. It is one of those things that every so often there are minis that are a pain to work on & just don't look the way we want them to; I usually put them aside for awhile...they normally start looking better with time. Be that as it may, I hope the rest of the paint job is more enjoyable. Have FUN! 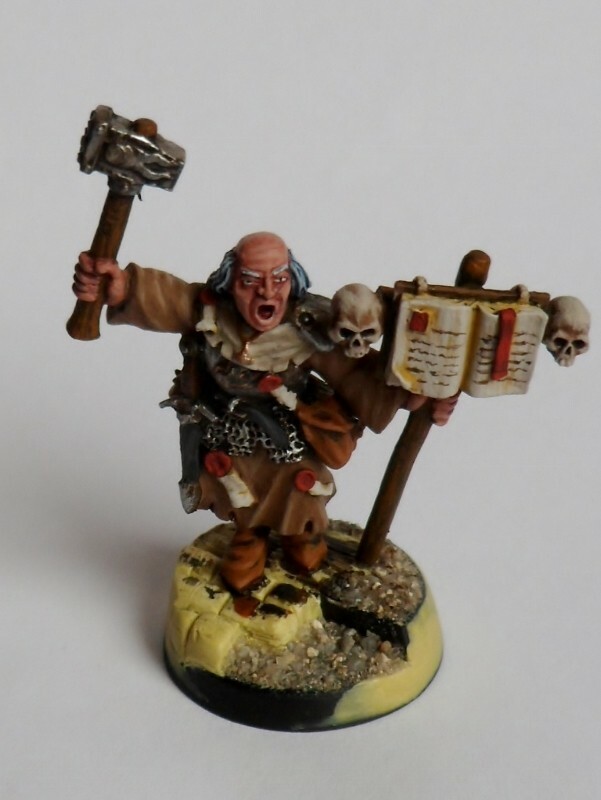 Used yesterday evening and night (until 1 o'clock) to concentrate on the Sigmar Priest. 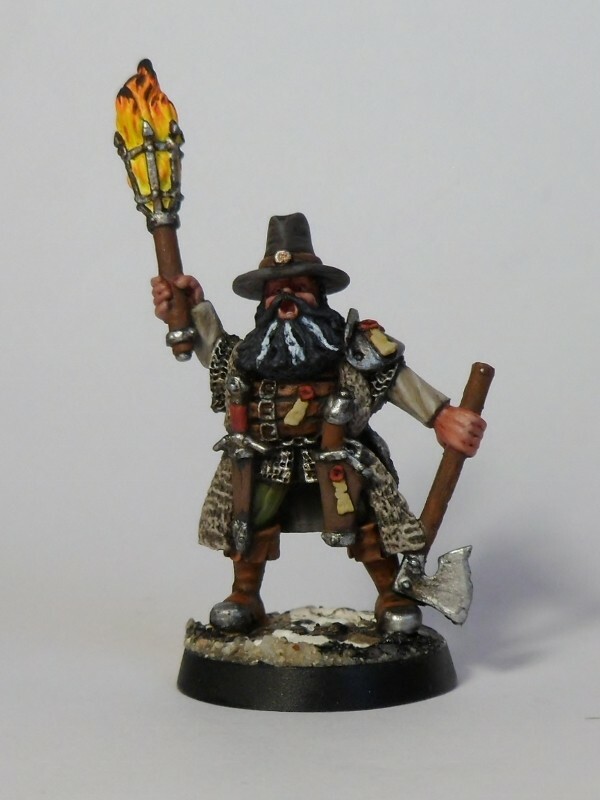 I have to say, that working on a miniature after an other and not several at the same time seems to be the best way for me. Right now i am quite satisfied with the Priest. And I have to say thank you Deaf Nala and cuboid. Without your kind comments I would have decolourise the Priest instead of put him aside for a while and try to get the best of hin. The Holy Guy looks RIGHTEOUSLY TERRIFIC! Your colors have an earthy warmth to them that fits the subject perfectly. Your brushwork is OUTSTANDING; GREAT freehand AND the skulls & the Priest's expressive face are WONDERFUL. GREAT WORK! And I have to say thank you Deaf Nala and cuboid. Without your kind comments I would have decolourise the Priest instead of put him aside for a while and try to get the best of him. I'm glad to have been of some service...all for one & all that stuff. AND I agree that painting the minis one at a time is much more rewarding. 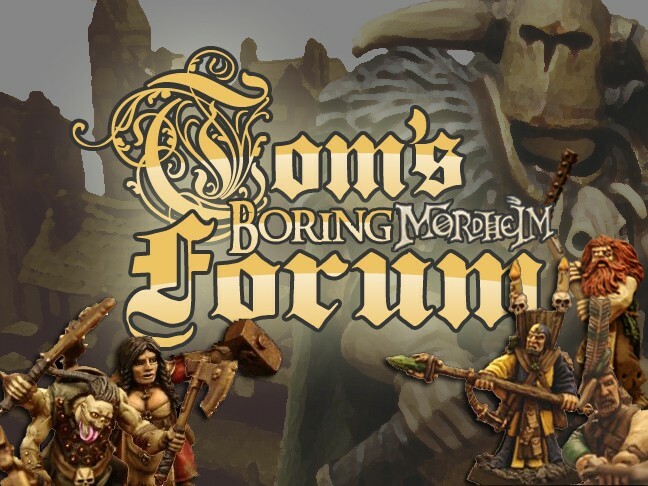 It also lends itself to individualizing the pieces, which suits skirmishing games like Mordheim. you're welcome, he looks great! not every model has to be a riot of contrasting colours, and we all have our own style and vision when we paint, and with humans particularly i like the gritty shabby look.  It's friday and so it's time for an update. I changed the hair, the eye and the comet on the hammer and the breastplate. The eye is now like the same of Karl Dall ( a german comedian). 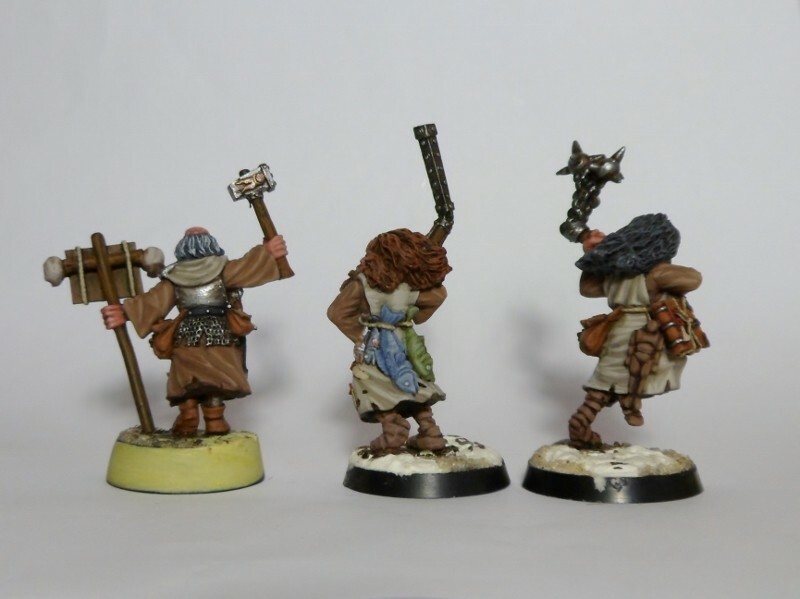 I also finished the tow flagellants. 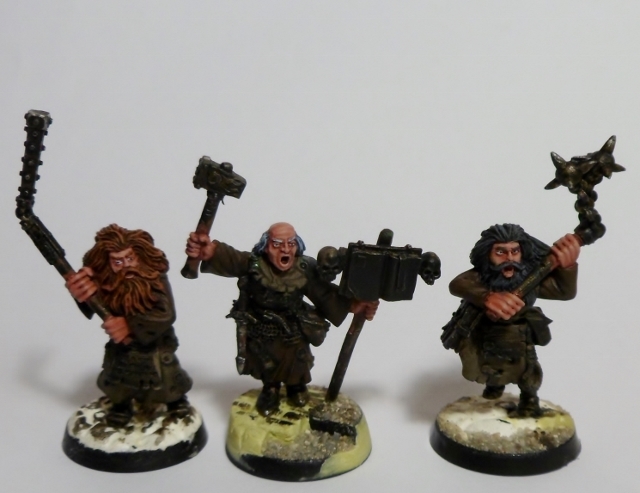 Only four miniatures left and the warband is finished and ready for their first battle. AND I thought you couldn't improve on perfection. That is quite an improvement. The Holy Guy & Associates really look the part. GREAT brushwork & some FINE color choice...OUTSTANDING WORK! @ Deaf Nala: How come you know who Karl Dall is? @ smile: your warband is coming along nicely. Are you going to do all the bases in a row? @ Grimscull Yup, I will do them in a row. So they will look all the same, because I have to mix some colours for the cobblestones. 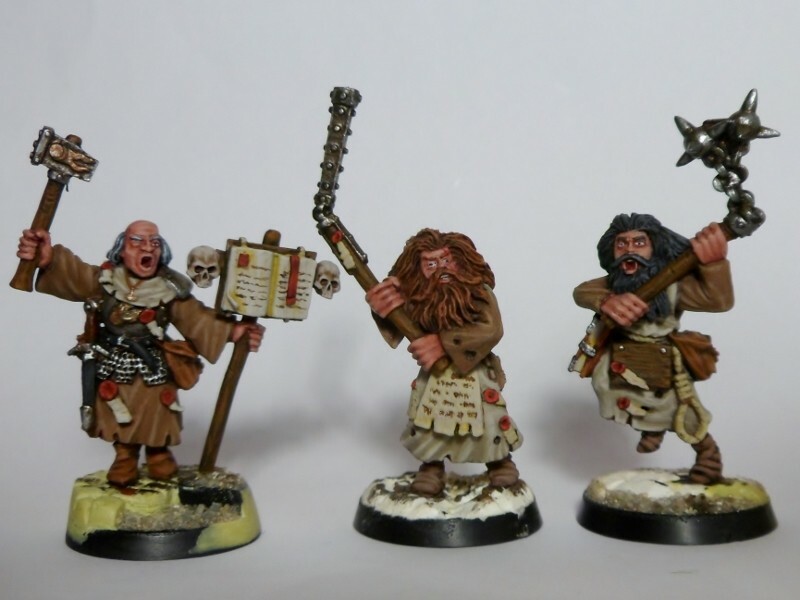 I think they would fitt perfectly in your possessed warband. Because I'll have this weekend hardly time to paint, I tried painting the fire. For me fire is one of the most difficult elements to paint. So what do you think - is it ok, or should I repaint it? And have you any tips for me? Fire does give most everyone a problem. I think it the bit that the yellow is the under color & it highlights up to red while it feels like the colors should be reversed. However, it looks like you got it down perfectly...or approaching perfection. GREAT WORK! Sorry to hear your weekend has been spoken for. @DeafNala The weekend will be full of work but it's really enjoyable work. I was asked to make Bofur's pipe from the Hobbit for a cosplay. The only problem is that I have to do it until monday because the The pipe is need for a con next weekend and I have to send it with mail. A labor of love is a whole different matter. Have FUN with the pipe! Imo, the fire is a little on the yellow side, but maybe that's just me. Also, when I look at the metal parts of the torch, I think a combination of the left and right might look good. Not all metal, not all yellow, but maybe metal drybrushed with yellow? 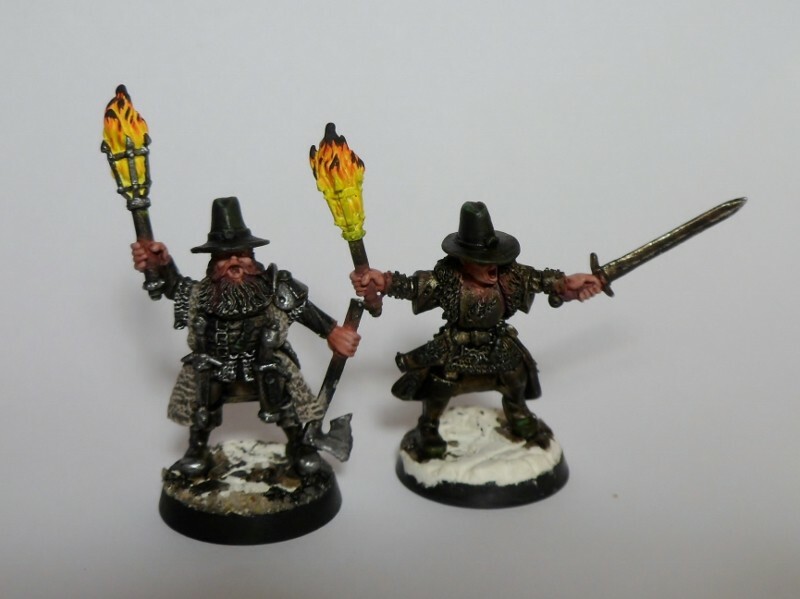 When I do torches (and I do paint up witch hunters quite regularely), I basecoat with the brightest colour und then drybrush with a couple of layers, each layer a little darker than the former and going a little more to the top of the flames. Quite the reversible order of how you usually do it. Since you mention the Cosplay: do you know anyone from the former Mytholon-crew? Falk perhaps? I was a couple times at the Mytholon to play Mortheim but I would not say that I know him. Just like a coustemer would know a Shopowner. The flames look a little bit to yellow on the picture. It is more in the orange/red. I will try the drybrushing as you mentioned. 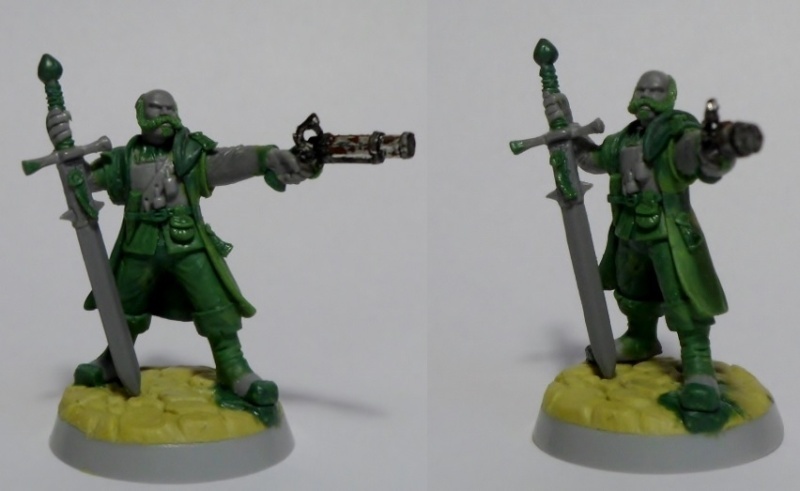 The commission work took me only saturday and so I could use today to paint the first witch hunter. And so there are only 3 hunters to paint. The fire look a little bit yellow on the picture. to be honest the fire looks to white, and thus to hot. In the last picture it looks a bit better.